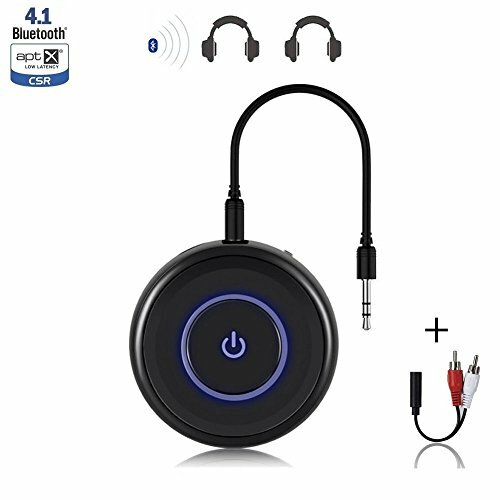 TX Mode as Bluetooth Transmitter - Adding Bluetooth function to TV, DVD, PC or any audio source device, streaming high quality audio to Bluetooth headphones / Speaker. RX Mode as Bluetooth Receiver - Turn your wired speaker / Headphones / Car stereo into Bluetooth wireless and then pair your Smartphone, enjoy Hi-Fi music wireless. NOTE: This adapter won't be able to transmit and receive audio simultaneously. With the aptX, let you stream your favorite movies, games and late TV shows lag-free. Uncompromised sound ,aptX audio coding delivers real-time streaming high quality stereo audio. Enjoy premium CD-quality audio experience without the nuisance of wires. An extra-long battery life of 14 hours means you can enjoy music for almost the entire day before the next recharge. Non-stop streaming as you can use it while charging. Even better is that it will automatically re-pair every time you use it. When you back, BTI-018 can be automatically re-paired and connected to the paired device whether in TX or RX mode. In TX, can be paired to two Bluetooth audio devices, and streams audio to both of them simultaneously. In RX, You can pair two smartphones (or tablets) to BTI-018 simultaneously.